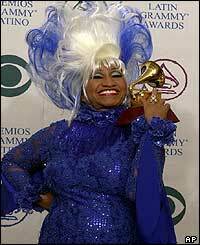 Celia Cruz, the greatest salsa singer of all time, has died of a brain tumor. This is sad news indeed. She’s one of my favorite musicians ever. Playful, rhythmic, outrageous, strong. Her voice was a force of nature. It was as unique as the taste of rum, way too deep for a woman’s voice, way too high for a man’s voice. My favorite Celia Cruz record is probably 2001’s “La Negra Tiene Tumbao,” which managed to be both modern and traditional at the same time, and a massive dancefloor shaker too. But she’s had so many amazing records that it’s hard to pick. CNN’s Maria Hinojosa did an interview with Celia Cruz in 1987, and it began a long friendship. Her recollections are worth reading. Myself, I heard Celia Cruz for the first time because of her duet with the Talking Heads’ David Byrne on the soundtrack for the film Something Wild, “Loco de Amor (Crazy for Love).” But her songs on the outstanding compilation “The Latin Vogue, Sequence One” were the soundtrack to my first visit to New York City in 1990. I’m DJing next Monday at the Akropolis’ Divadelni bar for another one of our Latin electronica sets, “Viva La Musica,” and you can bet Celia Cruz will be right at the center, packing the dancefloor even on a Monday night. « Is Prague Still Cheap to Live In?